Step one is to dye the filters. 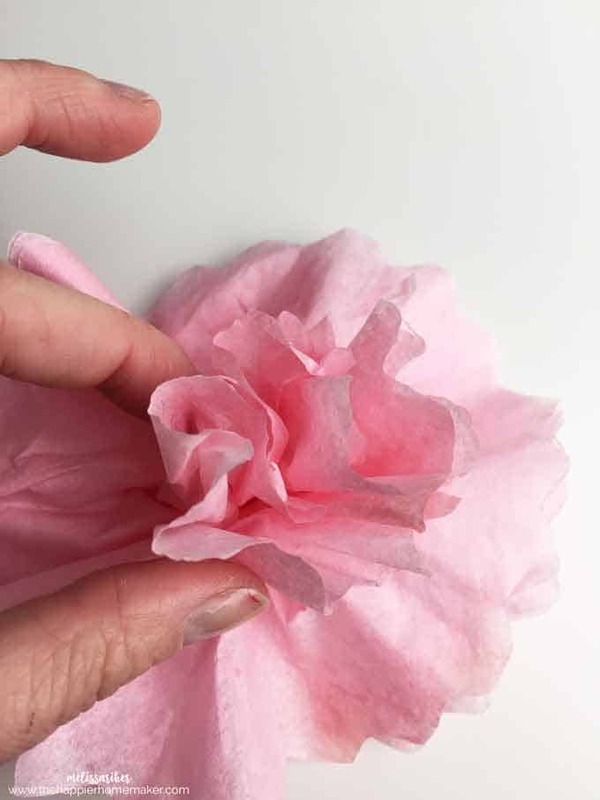 I simply mixed about a teaspoon of craft paint with 1-2 cups of water and dunked 1 centimeter thick stacks of coffee filters in the water, allowing it to wick up and leaving the edges lighter than the center. Then, because I can be impatient, I dried my filters for about two hours on the lowest setting of my oven (being very sure to keep an eye on it for safety!) 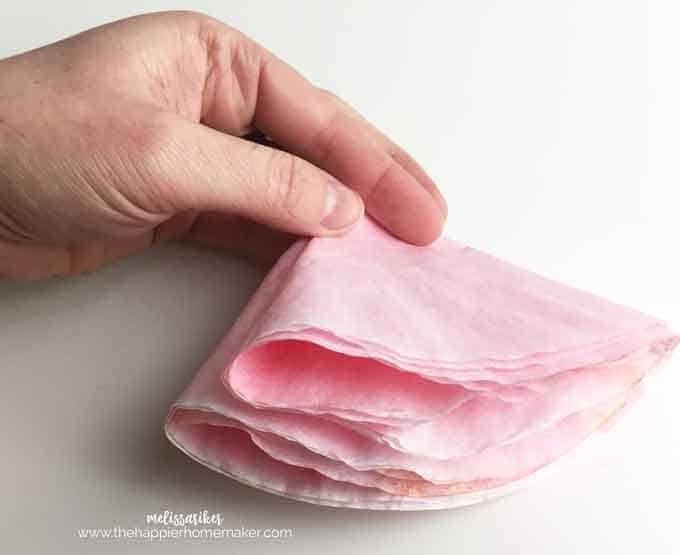 You can easily let them air dry overnight as well. I made a few different kinds of flowers to give my bouquet variation. 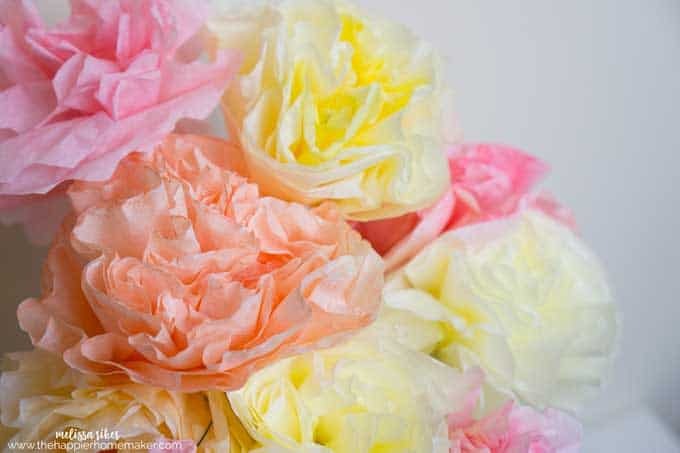 The first, smaller rosettes were made with just one coffee filter, some tape, floral tap, a skewer and scissors. 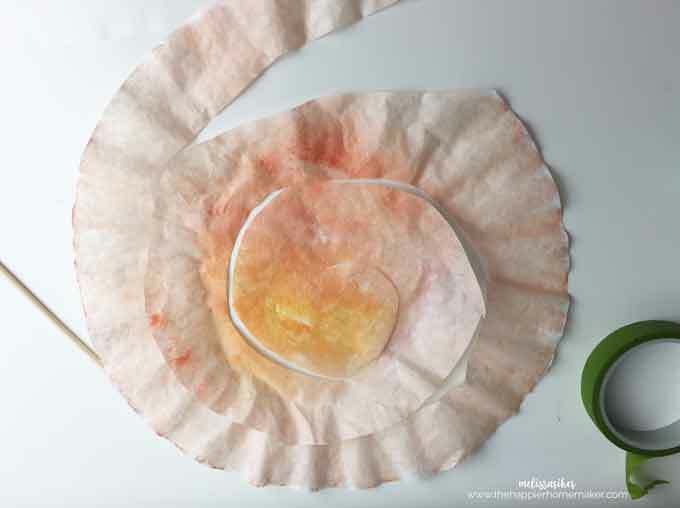 Cut the coffee filter in a spiral about 1 inch in thickness. 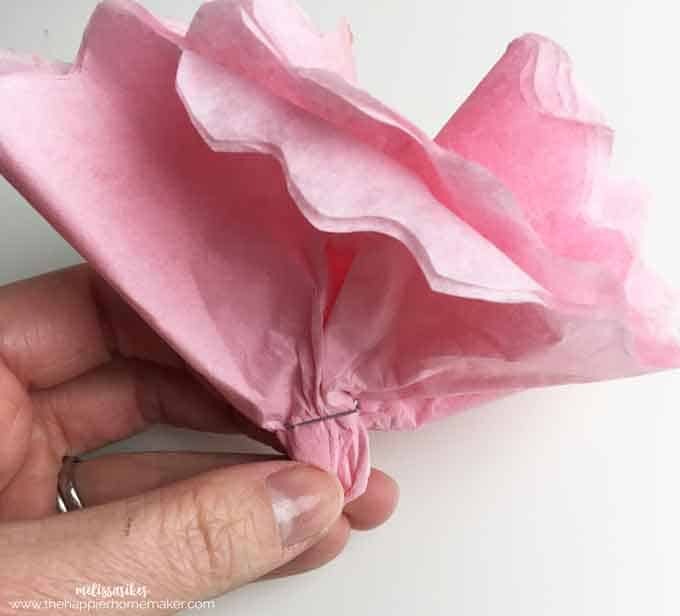 Lay about 12″ of tape on a table (use the ends to anchor it to the table) and pleat the coffee filter along the tape-no worries about perfection here! 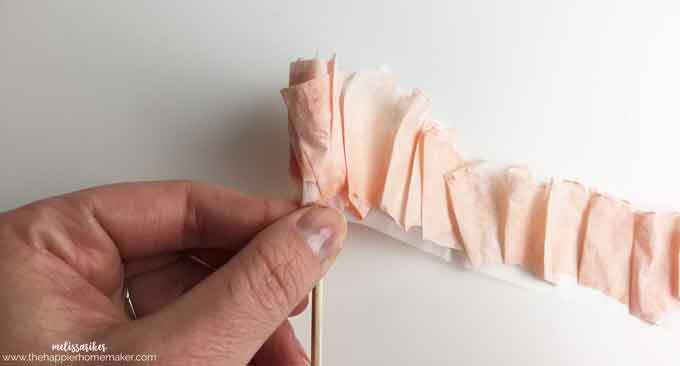 Wrap the pleated tape around the skewer-you can use a dollop of hot glue to adhere it if necessary. 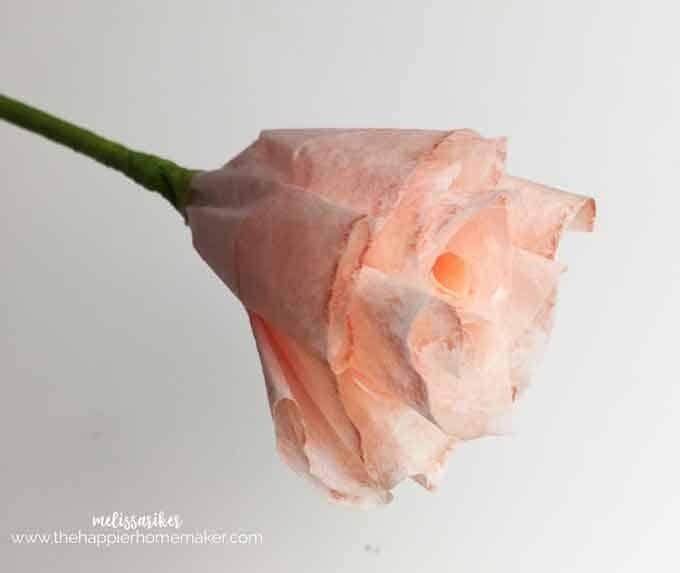 To finish it off wrap the base of the flower and the skewer in floral tape. 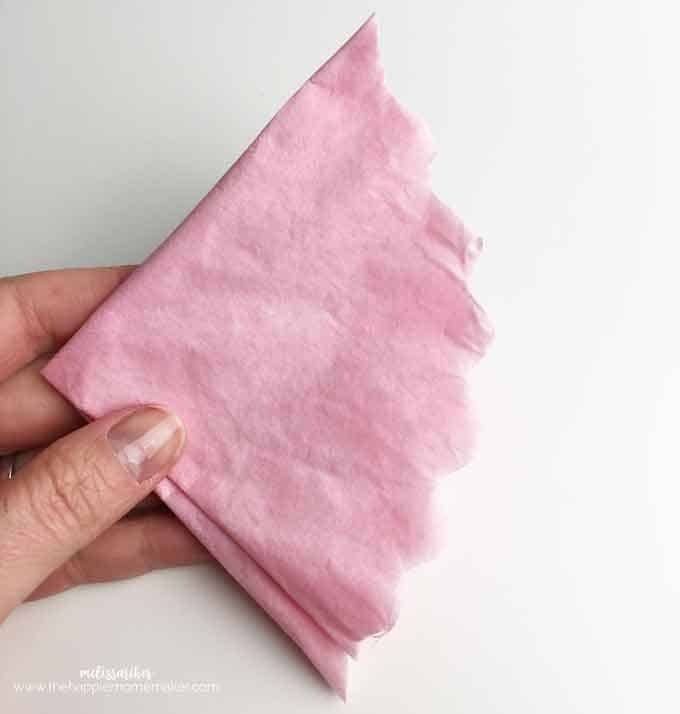 Use scissors to scallop the edges. Unfold and lay flat. 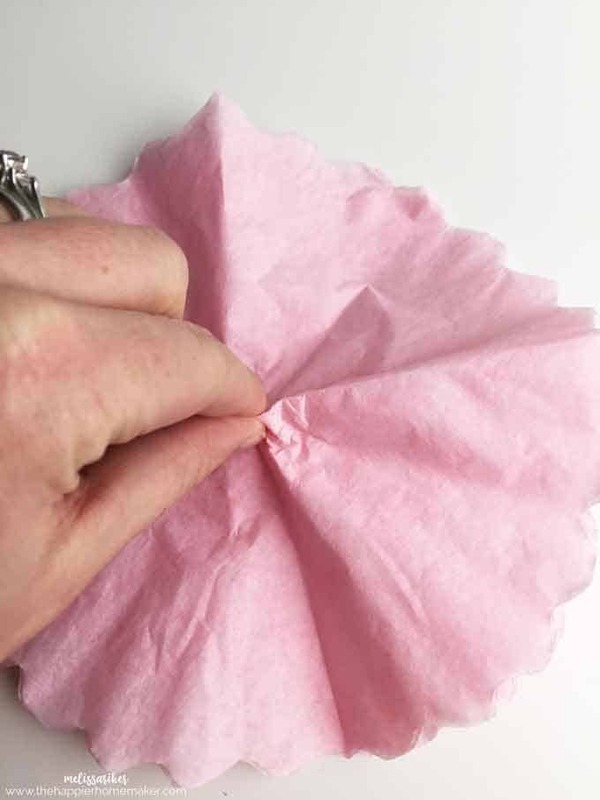 Use your fingers to grab the center of the filter and pinch it upward. You can pinch just a bit or a lot depending on how you’d like the final flower to look. Give that pinched portion a little staple to hold it in place. 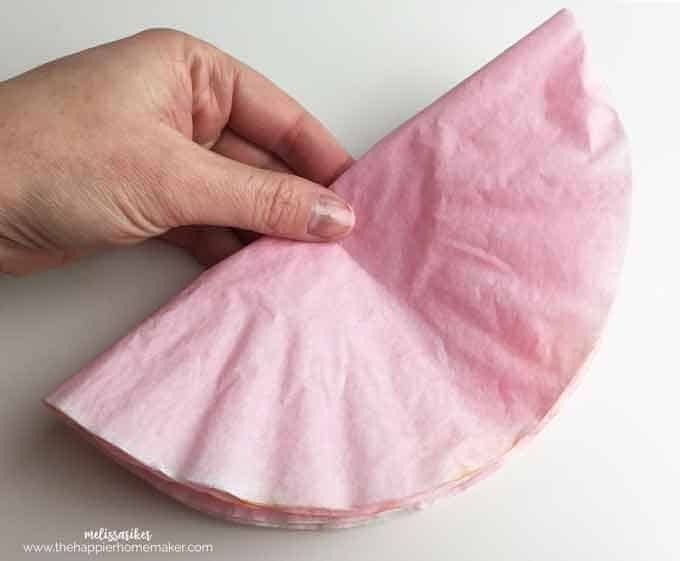 Starting with the inner most layer of coffee filter, peel it inward and repeat working your way to the outermost layer. Ta-da! 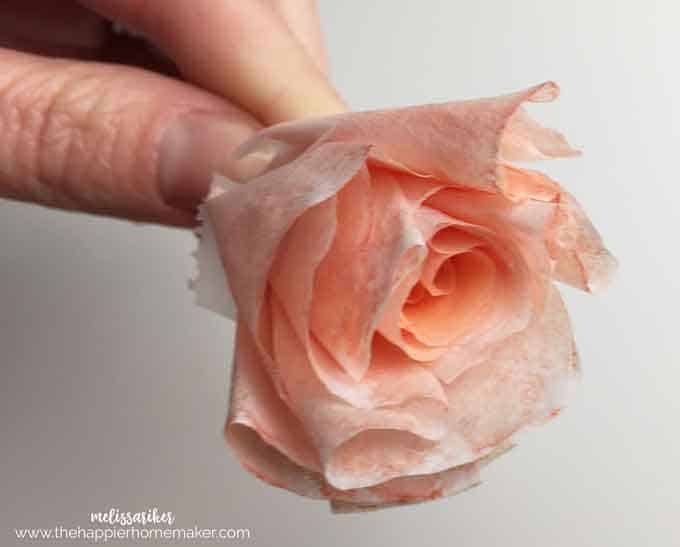 Then simply push the skewer through the staple or secure with hot glue and wrap with floral tape. 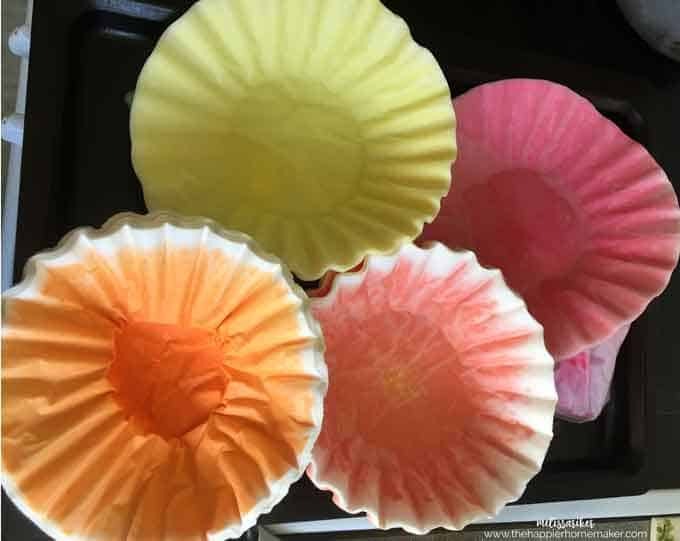 You can experiment with different scalloping shapes when you cut the filters, pinching the base more or less, and using varying amounts of coffee filters to add variation to the flowers-remember nature doesn’t make all the flowers look the same and neither should you! 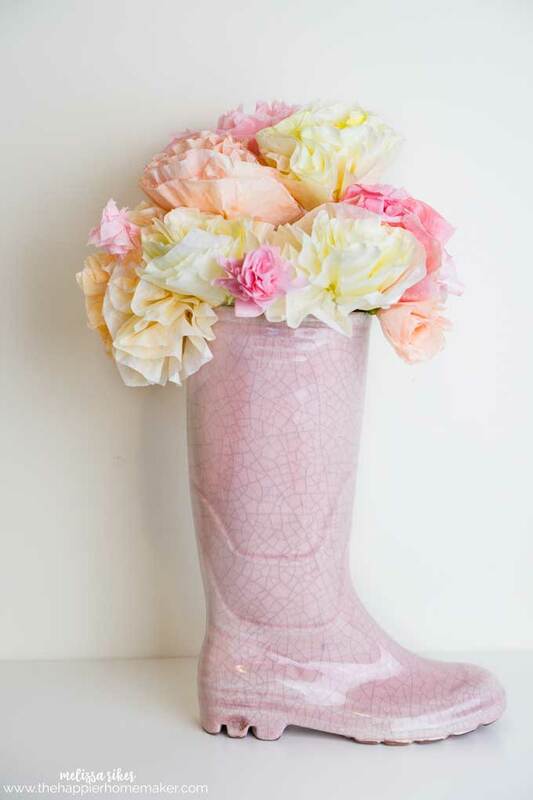 I displayed mine in a pretty little wellie-shaped vase my dear friend gave me last fall for my birthday-it’s perfect for spring! 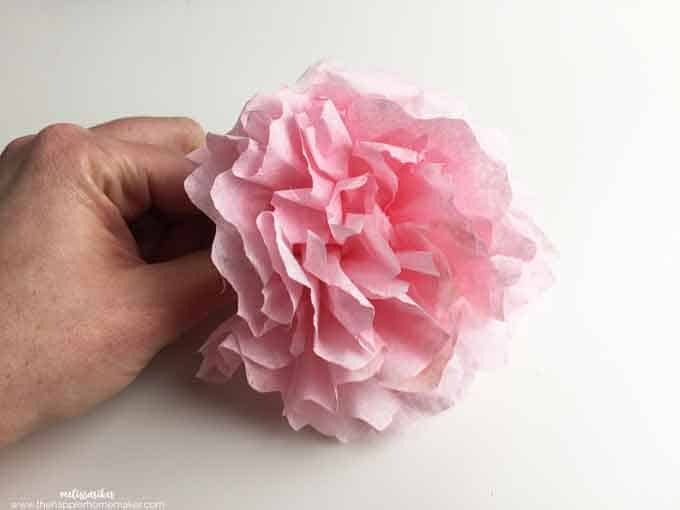 For even more variation you could add in some tissue paper flowers as well-see that tutorial here. Is it looking like spring in your neck of the woods? 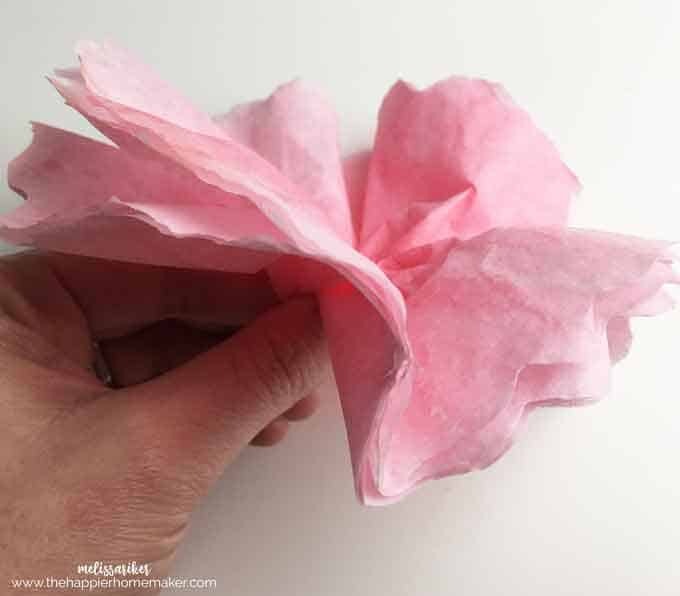 I really like your post and the information you shared in it that how we make beautiful flower bouquet by using coffee filters. 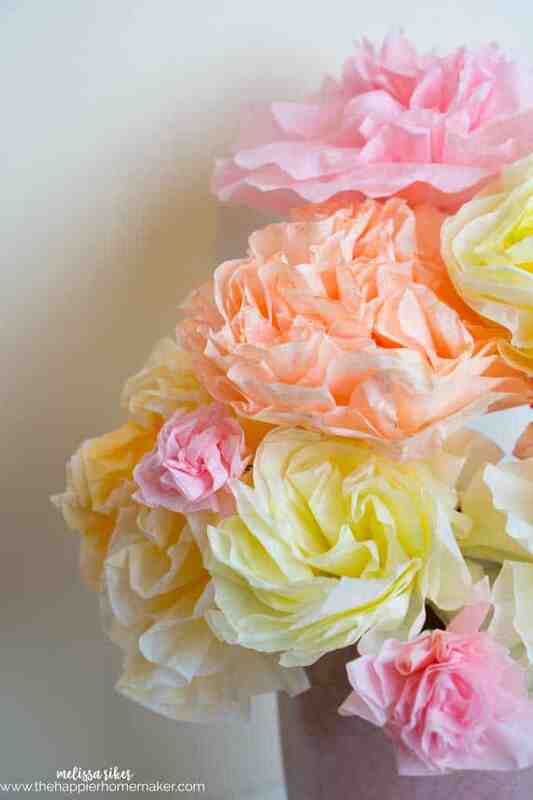 There is lot of fun while making a spring bouquet using coffee filters. 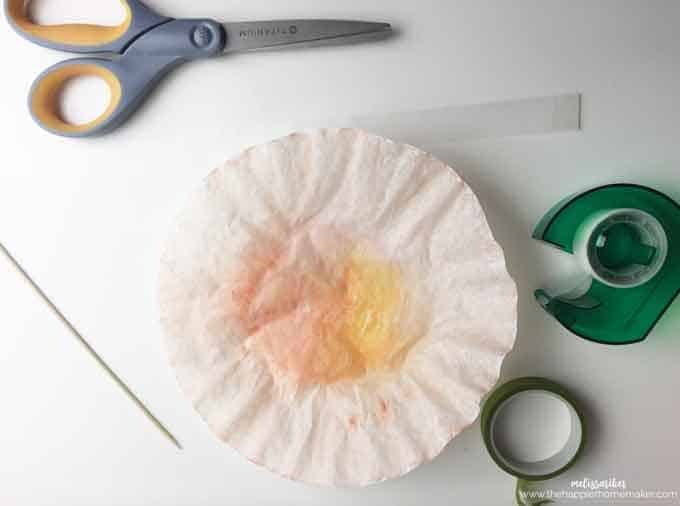 One can do lot of creativity while designing crafts with simple coffee filters.